Yggdrasil has given the thumbs up to the release of its latest slot Champions of Rome, in which mighty gladiators face off on the reels. Set in one of the world-famous Colosseum, the game sees swords, tridents and maces make Wilds appear as they hit the reels, and granting players the chance to test their own bravery. “Champions of Rome is a visually impressive game where players are in control of how much they want to risk,” said Yggdrasil’s head of slots Jonas Strandman. 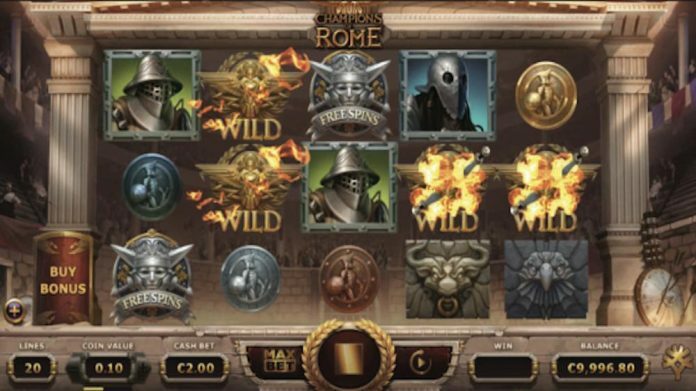 Champions of Rome’s main feature is Added Wilds, with four Wilds hitting the reels every time two Scatter symbols appear in base play, as well as in every spin during each Free Spins Mode. The title also features two different Free Spins Modes, Training Mode or Deathmatch. Players are able to choose which mode to play. In Training Mode, players earn eight Free Spins and can keep all their winnings. In Deathmatch Mode, players have fewer spins to gather a certain amount of coins and get a multiplier of up to 4x on all winnings. If those players lose, they must surrender their winnings from that Free Spins round. However, losing players then get a consolation prize consisting of coins or Training Mode spins. Champions of Rome is built on Yggdrasil’s proprietary HTML5 client framework, iSense2.0+, which allows for seamless gameplay on both desktop and mobile. The title also comes complete with Yggdrasil’s collection of in-game promotional tools, designed to increase customer retention, including Boost functionalities.